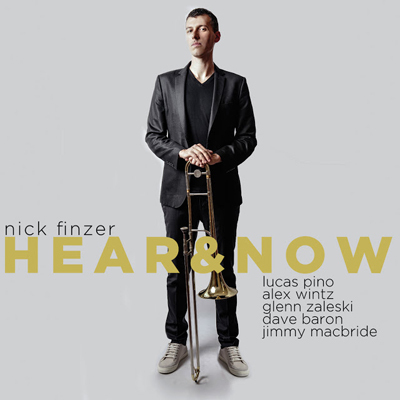 Millennial-generation trombonist, composer and arranger Nick Finzer is new to me, but not to the jazz world. The son of well-known flutist Sherry Finzer, he developed and interest in jazz at an early age, became a fan of Duke Ellington and, while in high school, performed at the Essentially Ellington jazz competition at New York’s Lincoln Center. Finzer attended the Eastman School of Music, and then received a master’s degree at Juilliard. While at Eastman, Finzer impressed Wycliffe Gordon, who composed four pieces for him; while at Juilliard, Finzer was mentored by the legendary Steve Turre. In 2011, Finzer won the Eastern Trombone Workshop National Jazz Trombone Composition, after being a finalist in the 2010 Trombone Association’s Carl Fontana Jazz Trombone Competition. Finzer’s debut album (Exposition) was released in 2013; his second (Chase) followed in 2015. This new CD features him with his sextet; all the tracks are original compositions except for Ellington’s “Single Petal of a Rose.” Two charts are true burners: “We the People” and “Race to the Bottom.” “Lullaby for an Old Friend” and “Love Wins” are mid-tempo, and all the others are ballads. Finzer’s handling of “Single Petal” is one of the most gorgeous renditions of that classic that I’ve ever heard. His instrumental dexterity is superb; his tone is clear, clean and — with the ballads — beautiful. He’s backed by equally talented sidemen: Lucas Pino (tenor sax and bass clarinet), Alex Wintz (guitar), Glenn Zaleske (piano), Dave Baron (bass) and Jimmy Macbride (drums). Finzer’s web site indicates that he has a heavy performance schedule; although his home base is New York City, he travels a lot throughout the States and in other countries. Keep an eye out for him: He’s a great talent, and you don’t want to miss him.